I think it is safe to say that most, if not all, of us have heard various things about BPA. Over the past year or so, it has been all over the media, especially the Internet. But what do you really know about BPA? Sure, you kn ow it is bad and you should avoid plastics with it, but do you know why it is bad? What exactly is BPA anyway? Is it only in plastic bottles and containers? Where else can it be found? There are so many questions! To get all the answers and read my full article, hop on over to The Ohana Mama! When you think of Easter gifts, what comes to mind? Plastic baskets, filled with plastic grass and plastic toys and candies made with high fructose corn syrup and lots of other artificial yucky stuff. I don't know about you, but I'm done with those things. With less than 2 weeks till Easter, let’s look into some ways that you can make your Easter celebration more green and eco-friendly. Coloring Easter Eggs. It's hard to resist the traditional egg dying kits adorned with cute litle bunnies that make egg coloring so darn easy. But I have to onder, what the heck is in those fizzing little tablets? So I am skipping them from now on along with other artificial food colorings, even ones from the grocery store. Personally I am trying to limit Why? Well for one, Red Dye #40 is thought to cause behavioral issues in children. Not that anyone is eating egg shells, but you don’t know what can leak into the egg and in general, I just like to avoid it. 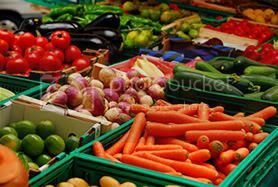 Visit your natural food store of choice and see if they carry some all natural food coloring. In my online searches, unfortunately they do tend to be a bit pricey. Though I did find a plant based egg dye kit at Nova Naturals. Put enough water in the pot to cover your eggs and add one teaspoon and the item you are using for the dye. Bring your eggs to a boil and then let simmer for 15-20 minutes. Not only is this natural, it is also fun and educational for your kiddos. If you have compost, you can throw the scraps of onion skins, spinach, etc. right in. 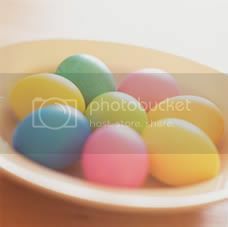 I haven’t decided if I want to color eggs this year, but if I do, I’ll be sure to take pictures to share. Baskets. Head into most stores right about now and you’ll find loads of plastic baskets. Now instead you could make your own, but personally I am not gifted enough to do that. I bought some wood Easter baskets a few years back and I just reuse them every year. They are not a very green choice, but I already have them so I’m gonna use them. 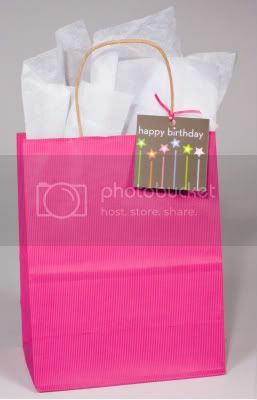 Another idea I had was buying a reusable shopping bag and then putting all the goodies inside. 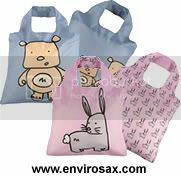 Envirosax has a cute line of kids themed bags that I think would be perfect, and then they can be reused over and over. I actually really like his idea. Easter Grass. Please, please skip the plastic grass. After you toss it in your garbage it is going to sit in a land fill for thousands of years. I’ve read some things about growing some real grass to put in your baskets. Pretty neat idea. But I found another one that I like even better – shredded paper! We have a stack of old documents waiting for me to run them through the shredder so how cool to be able to actually put those into use. I can fill the baskets with the shredded paper and then toss them in the recycling bin when we’re done with them. Love it! Even better would be to add it to your compost (I really need one of these). 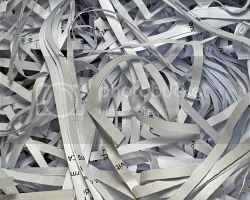 Now shredded documents might not look very much like grass, so I see nothing wrong with shredding up some green paper, as long as it is recyclable paper. Toys. Now this is the point where I ask myself “do the kids really need more toys?” The answer is no. And they certainly don’t need cheapie plastic toys. How about a good book instead? Or maybe some art supplies? 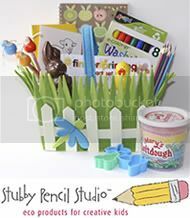 Stubby Pencil Studio has tons of eco-friendly art supplies and other eco-friendly toys. 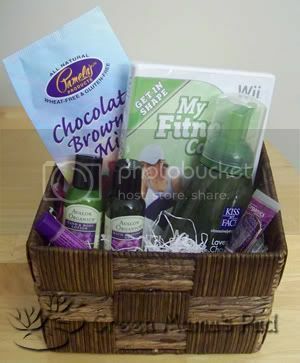 They even has a section dedicated to Easter where you can pick a basket and the goodies to go in it. If you want to go the book route, I have had great success at the Target Dollar Spot. They almost always have some small books in there. I recently got the boys some animal/science books that I tucked away just for Easter. So there you have it, just a few tips to have an eco-friendly Easter. Do you have any tips of your own? If so, I would LOVE to hear them. So please share them with us and have a happy, hoppin, green Easter! Is it just me or are there a lot of green terms out there that when you see or hear them you say "huh?" I found myself doing that today when doing some research and I thought there must be others out there like me. So I thought it would be helpful to start a "Green Glossary" series to help out. Here are my first two entries! Waste paper that has served its intended purpose and has been separated from solid waste to be recycled into new paper. This is the paper that we place in our paper-recycling bins every week. 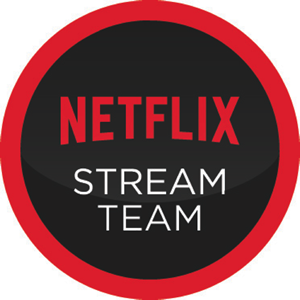 It has reached the end user, and thus is qualified as post-consumer waste. This fiber has never seen a consumer. It usually contains leftovers and cutoffs from a paper mill’s production process or the same from paper converting plants such as envelope manufacturers and printers. This paper waste is collected and shipped back to a paper mill for recycling prior to hitting the consumer waste stream. Last Thursday I planted my seeds and it has been an exciting week for me since then. My husband thinks I'm nuts for getting all giddy over these, but it is so cool to watch your little plants grow right in front of your eye. And since this is my first time planting vegetables, it makes it that much more exciting. I honestly cannot believe how much they have sprouted already. 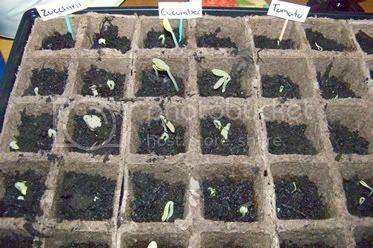 Particularly the cucumber and zucchini seedlings, they are huge already. Let me share a few pictures. 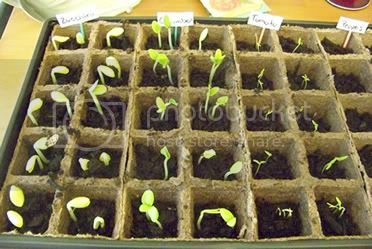 Here they are on Tuesday (3/24), you can see there are little sprouts in the cucumber and zucchini containers. Nothing yet for the tomatoes and peppers. Then here they are one day later (3/25). Look how much they have grown in just one day! William was so excited when he saw them yesterday. "Look mommy, your plants are growing!!" Finally, here they are this morning. I swear they have doubled in size. Now I also have tomato plants sprouting up. It amazes me how much has happened in the last 3 days. As you can see the zucchini and cucumber plants are growing fast. I fear they are going to be huge soon and I will need to transplant them outside sooner than I expected. I suppose now I should figure out just where exactly I will put them outside. Nothing like waiting till the last minute to plan! Ideally, I have a big empty flower bed up against the side of the house that gets lots of sun. I'd love to put them there, but is it OK to put a vegetable garden next to the house? The hose is right there too, perfect. There is also a sunny spot over on the other side of the house by the shed, but the hose is no where near that, I'm not sure it would even reach. What about planters on the deck? I know I can keep the tomatoes in planters, but what about zucchini and cucumber? Where are my gardening experts? I'd love your insight on vegetable garden placement. 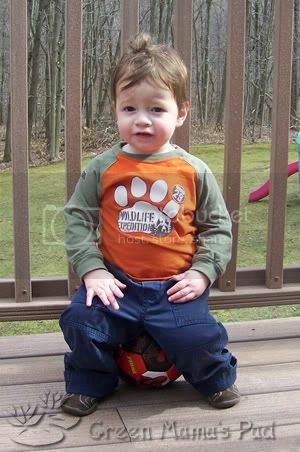 For more Wordless Wednesday posts, please visit MomDot and 5 Minutes for Mom. I think most of us are familiar with school fundraising. Even for those without kids, you've probably been asked by a niece, nephew or neighborhood kid to purchase something for a fundraiser. The problem with most of these school fundraisers? A lot of it is junk. While we are concerned with childhood obesity (as we should be) we then ask our children to go out and sell candy bars, frozen cookie dough and other unhealthy treats that are loaded with high fructose corn syrup, hydrogenated oils and lots of artificial ingredients. Greenraising was started by the parents of elementary school children who watched how their school's parents associations struggled each year to raise the funds necessary to provide an excellent education, and who bought their share of cookie dough and magazines to help that happen. At the same time, they noticed that their children were coming home with concerns about the environment, pollution, global warming and living conditions in the world, and were feeling helpless to change things. A little research yielded a host of small things each family could do to help the situation, and a light bulb went off (well, technically a compact fluorescent bulb). Greenraising was created to help solve both problems: raise money for schools and give children an opportunity to learn that their actions can change the world. What a wonderful idea! 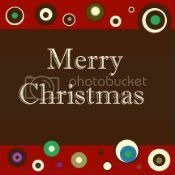 If you visit their site, you can see they have a wide variety of products to choose from. 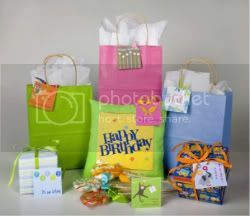 They have items like recycled gift wrap, reusable water bottles (like SIGG) and reusable bags. Looking for something sweet? Well choose one of their fair trade, organic chocolates. They even have fair trade, organic coffees and teas. They also have two ways to sell: online sales and traditional catalogs. The online feature is great. Customers simply shop and then just name your organization as the beneficiary (it must be registered first). It is easy and greener since there are no catalogs. I'm passing this on to you all so you can then pass it onto your schools. Make your schools choose green fundraising and help them raise money while teaching our children about caring for the environment. 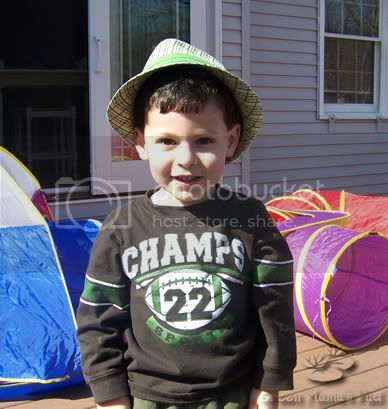 My boys are not school aged yet, William won't start kindergarten till 2010. But when they are, I fully plan on presenting Greenraising to our schools. I would love to be able to cut out the junky fundraisers and replace them with one like this. I see many PTO meetings in my future! Hello to new readers stopping by from the 5 Minutes for Mom Ultimate Blog Party! I am glad you are visiting! 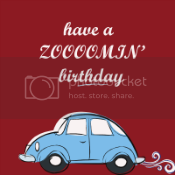 Be sure to leave a comment and your blog URL so I can return the favor! A little bit about me: I am a mom to 3 boys living in New England and trying to make more eco-friendly choices for our family. I started this blog to share my green journey and help others make green changes to their lifestyle. What kind of things can you find here? On Mondays I always share a Going Green Tip and Fridays here are Green Giveaway Fridays where I compile a list of green giveaways going on around the blogosphere. In between you will find reviews of products I love, giveaways, my organic gardening journey and a little bit of my family mixed in. Plus so much more! And if my top three picks are already chosen, I’d love anything related to green/natural parenting or living or any Target gift certficate. 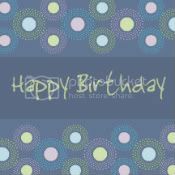 So get to blog hopping and enjoy the party! After having my supplies for weeks, I finally stopped procrastinating and planted my seeds! It was kind of a crazy morning. After i dropped William off at preschool I came home and got to it. 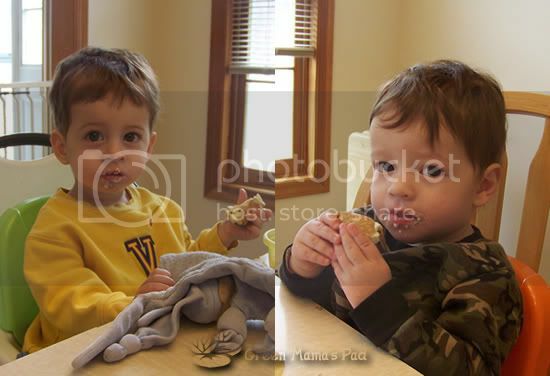 Of course Luke and Josh were very curious and it was hard to keep them from spilling dirt and seeds all over the place. So I gathered my supplies: organic soil, organic seeds and peat pots. 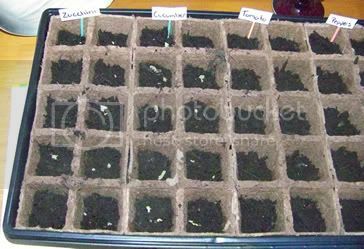 Initially I was only going to plant the pepper and tomato seeds as the instructions for both said to start indoors 6-8 weeks before last frost. But then I reread the cucumber and zucchini instructions and they said they could be started indoors 4-6 weeks before the last frost. So since I have 50 peat pots here, I figured I might as well fill them up. 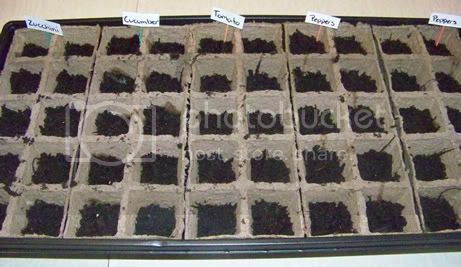 So I filled the individual pots about 2/3 with soil, dropped 2 seeds in each and then covered with some more dirt. Here is a picture of the zucchini seeds. I had no idea they were so big! The cucumber ones were pretty big too but the tomato and pepper seeds were small. You know how annoying all those little pepper seeds are when you are trying to clean a pepper? Yeah well, they are just as annoying when trying to get them out of the seed packet. I did take pictures of each kind of seed, but I won't bore you with that. After I got all he seeds planted and covered with dirt, I gave them each a little bit of water. Then I made my little signs to identify what is what. Just used some toothpicks and an index card with a little glue. Then I covered with the plastic dome, I guess this makes it kind of like a greenhouse. 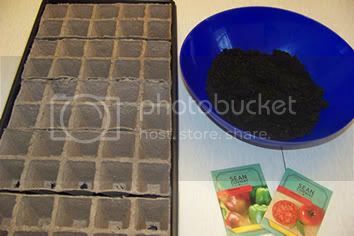 Now the instructions for the peat pots say to place them in a warm location away from direct sunlight. I think I may keep this on our kitchen table for now since it i counter height ad little nosy fingers can't get in them. Have I mentioned that I have no clue what I am doing? So please, if you ever see me dong something wrong, feel re to tell me. And don't forget to stop by next Thursday to see my progress. I’ve spent a good portion of the past 18 months in search of a good natural dryer sheet. I really hate when our clothes are filled with static and most of the natural dryer sheets I have tried have not done a good job at reducing. 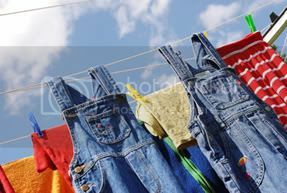 Did you know that static is caused by the synthetic materials that are drying in the dryer? So sure, I can get rid of it by only wearing clothes made from natural fibers like cotton. But let’s face it: it is New England, it is cold and my boys sleep in warm polar fleece (polyester) blanket sleepers. I’ve also tried home made solutions like adding a cup of vinegar to my wash or rinse cycle, but that did nothing. The first natural dyer sheet that I tried was something I found accidentally at Walmart. The brand was Eco-Select and they did a good job. Then several months later, they disappeared off the face of the Earth. I scoured the internet trying to hunt some down, but all I found was other people wondering what happened to them. So my search was back on. I found another brand at Walmart called Simplicity. I want to say they were better than nothing, but I’m not so sure that they are. They really weren’t effective at all. I decided to start dividing my washes by fabric type to try to minimize static. All colored cotton in one wash, all synthetics in another and occasionally a load of cotton whites. Doing my laundry this way eliminated static from all our cotton clothes, but man that synthetic load was a like a big electricity ball! 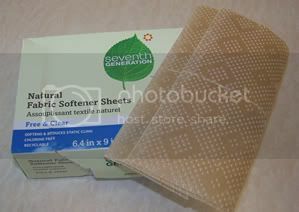 So earlier this year when I saw that Seventh Generation finally came out with Natural Fabric Softener Sheets I was thrilled. I have been using their Free & Clear Laundry Detergent for over a year and I am extremely happy with it. I finally ordered the dryer sheets two weeks ago and they have been working great so far. My cottons are nice and soft and static free. The polyester clothes still have some static, but it is so much better then before. It’s actually tolerable now. What I also love about these sheets is that they are plant based so no nasty chemicals and the paper is unbleached. Plus not only are they biodegradable but they are recyclable as well. So after I am done with them I can toss them in my recycling bin. I don’t know much about composting (ok nothing) but I suppose since they are biodegradable and plant based you could put them in your compost. Not 100% sure on that though, any composters want to chime in? If you are in the market for a natural dryer sheet, I would definitely recommend you give this one a try. It is, by far, the best one that I have used.